My husband is an artist and we have tons of colorful paintings and sculpture displayed throughout our home… not to mention the omnipresent scattered kids' toys that add a riot of color to any given space. We try to keep our decor neutral so it doesn't clash with everything else in our lives. As a result, our walls are plain, stark, boring gallery white. I was happy to undertake the challenge to "Break the Color Rules" by repainting one room in my house. 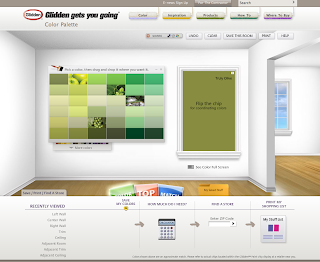 First I visited Glidden.com to see my paint color options. Unsurprisingly, they are vast! I really like the Glidden Color Palette tool, which lets you visualize what a color will look like in a room with a click of the mouse. 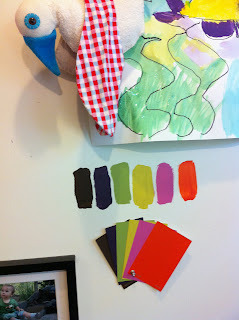 You can "drop" colors onto walls or moulding. In fact, you can even click to make the color swatch fill your entire computer screen so you can use your monitor as a giant paint swatch! Awesome. Another excellent website feature is the paint calculator. You add in your measurements and it tells you how much paint you need to buy. Handy for the math-phobic like me. The website will generate a printable shopping list for you, too. Technology is a beautiful thing. In the end, I decided I wanted to see the colors in person, so I headed to Walmart to buy some of the new Glidden Testers. These 2 oz. bottles of paint feature an easy-to-use brush attached to the resealable cap. Each bottle covers 2 square feet, so you should be able to get a decent idea of what the color will look like on your wall– no holding up a tiny paper swatch and squinting at your room, trying to visualize your results! 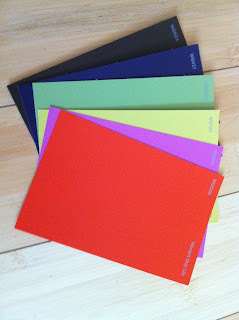 Even better, they are stocked in a pretty huge variety of colors so you can pick a bunch and test them out. See my ThisMoment story below to fully experience my shopping trip! My mission was to "Break the Color Rules" so I wanted to choose bright hues that I would ordinarily shy away from. Since I've decided to paint my home office, I also totally disregarded my husband's art school-honed sense of color theory. I just picked shades I was drawn to, the way you would shop for shoes or a handbag. It was exhilarating! I highly recommend scoping out some colors the next time you're shopping at Walmart. Obviously, I couldn't control myself. 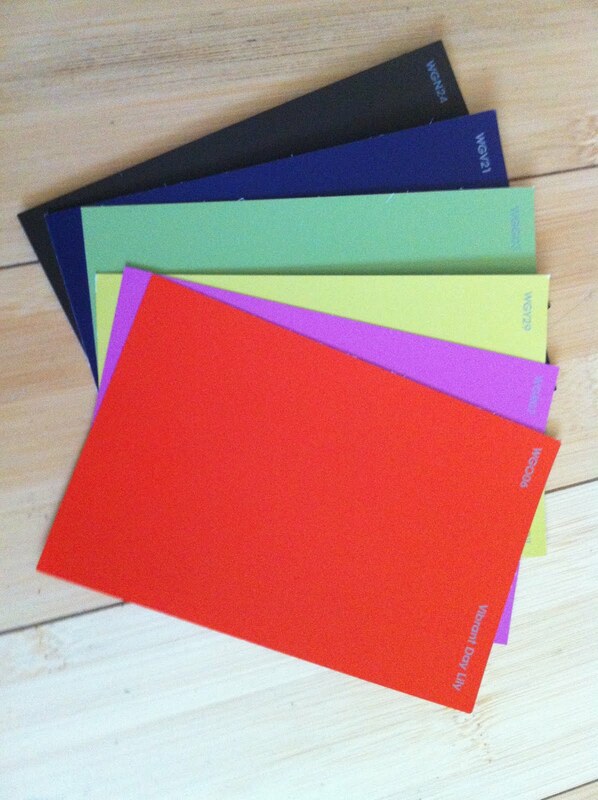 I was supposed to pick out three colors for my room and I ended up with six. But what a lovely half dozen! From top to bottom: Bittersweet Chocolate, Black Tulip, Spanish Olive, Extra Virgin Olive Oil, Blooming Fuschia and Vibrant Day Lily. My husband HATES the pink. Ha! The Glidden Testers are also about the same size as bottles of acrylic paints at the hobby store, so if you're a DIY aficionado, you might want to pick some up for crafting– house paint typically has excellent coverage and the rainbow of colors available is impressive. Hey, you know what? There's a coupon link on my sidebar that will give you $2 off per bottle, bringing the price down to less than a dollar in my store. Stock up, mini-Marthas! Aren't you dying to see what I come up with? Me, too! There are plenty of other Social Fabric community members embarking on their own painterly makeovers, some with the same "Break the Color Rules" mission as mine and still other brave souls are actually letting their readers vote on their color schemes! Yikes! You can check out everyone's progress on the Glidden Testers website or search the hashtag #GliddenTesters on Twitter. In accordance to the FTC Guidelines and WOMMA Code of Ethics, I am disclosing that this project has been compensated as part of a social shopper insights study for Glidden Testers/Paint #collectivebias. All opinions are, as usual, strictly my own. Oh, the suspense! I'm one of the crazies letting others choose, but I'm sure you'll have something fantastic in store for that room! Getting ready to do some painting ourselves. Will totally use this tool. Thanks for sharing! I love the colors you picked - I bet it turns out great. Good Luck! Wow, some bright colors! Are you going to use them all? I love that they have testers so you can try it out first!! Girl! Those are some BRIGHT and BOLD color choices!!! I'm so excited to see which one you choose...the suspense is killing me!!! Very fun! Can't wait to see what you pick! One of my local GA social media moms is also doing this!